I don't use heavy makeup on working days. In fact, after applying my skincare products, I straight away use some loose powder over my sunblock that contains makeup primer. If your sunblock does not contain primer, you have to use a primer before using your loose powder or BB cream or liquid foundation. The face primer, I was told can prevent the pores from clogging. Not sure how true it is but I have been following this ever since I knew about it. Most of the days, I will use eye shadow without mascara and sometimes no eyeliner too. This shortcut makeup won't give you the best result. If you use eye shadow, you will like using cleansing oil as you do not need to use a separate cleansing product for the face and for the eye. On days that I do not use makeup at all (usually weekends), I will still use cleansing oil or cleansing milk because as long as you use sunblock, you have to double cleanse. I have finished using the iconic Shu Uemura White Recovery EX Cleansing Oil a few months ago and would like to share with you my thoughts. 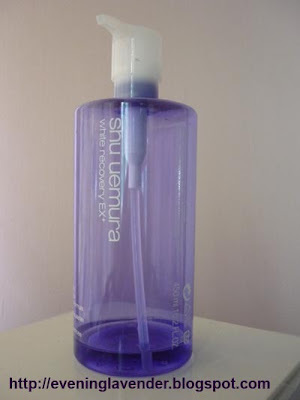 The Shu Uemura White Recovery EX Cleansing Oil was launched some time ago last year and I was lucky to win a 450ml bottle. I believe most of you adore this cleansing oil, not in particular the White Recovery one but may be other range. Apart from the hefty price tag, I think most of us like this cleansing oil. The one thing that I cannot comprehend is the price tag versus the ingredients. If you are not already aware, the main ingredient of this cleansing oil is Parafinum Liquidum or commonly known as Mineral Oil. Many skincare specialists believe that Mineral oil can clog pores and I am quite convince about the negative effects of mineral oil. Mineral oil is the by-product from the processing of petroleum. Therefore, organic products avoid using mineral oil as the ingredient in their products. That is why I feel safe using oraganic products. While I like using the Shu Uemura Cleansing oil, I think that it is overpriced. Mineral oil is a cheap ingredient and therefore the price must be cheaper. There are some good alternatives in the market that is 1/5 of the price of Shu Uemura cleansing oil. I will be reviewing them in future. So much of the mineral oil discussion. Let's get back to the review. In light of my doubt over the mineral oil content, I will use a gel cleanser after using this Shu Uemura cleansing oil. So far, I do not experience any breakouts. Therefore, I conclude that double cleansing can prevent any adverse effect from using mineral oil. This bottle of cleansing oil lasts me about 5 to 6 months. Do you like this cleansing oil? What is your view on mineral oil? Do you double cleanse when using this cleansing oil? Do share with me and other readers.